When asked what’s the most surprisingly fun place my family has ever traveled to, the response I always give is Tacoma, Washington. Tacoma is a small city that frequently gets overshadowed by the larger and more famous city of Seattle. But there’s plenty of family fun in Tacoma; it’s a great destination in its own right! Tacoma is stuffed with plenty of fun things for families to do, especially if your kids love museums. 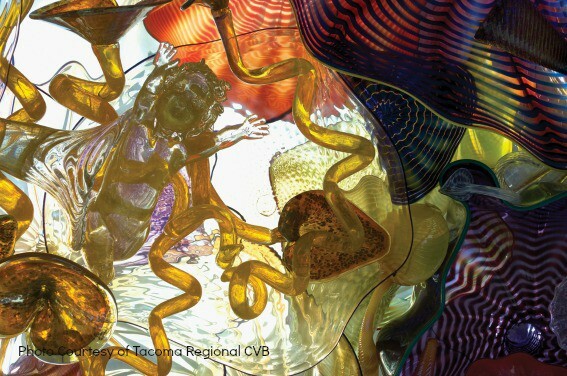 Start out with the fabulous Museum of Glass, which features the work of Dale Chihuly and other glass artists. You can sit in the hot shop and watch the glassblowers at work, wander through the museum and admire spectacular glass creations, and make your own art in the education studio! On our last visit, my kids spent most of the time picking their favorite pieces- their selections changed with almost every display case. After getting your fill of beautiful glass art, head across the pedestrian bridge (which has more beautiful glass art to admire!) to the amazing Washington State History Museum. This excellent museum has lots of interactive displays to help you learn all about the state’s history. For train lovers, there’s a huge model train display to admire. My kids had a blast in this museum and didn’t even realize how much they were learning about the state of Washington while they played. Also located nearby is the Tacoma Art Museum. 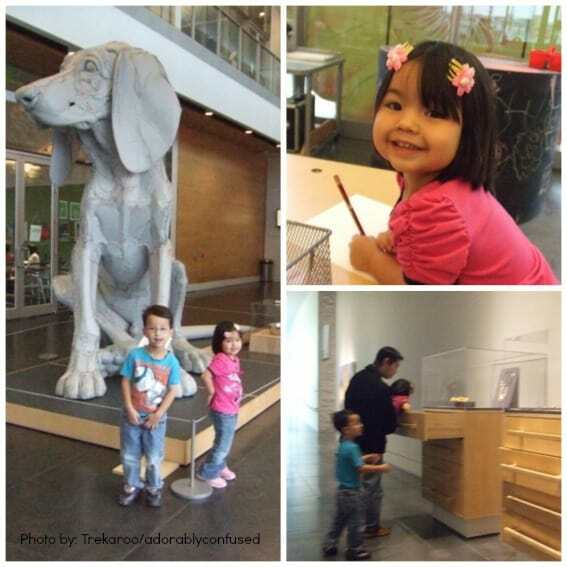 This art museum is on the smaller side, so it’s a good art museum to visit with little ones. Kids will be introduced to many different styles of art, without being overwhelmed and tired. My family’s favorite feature of the Tacoma Art Museum is the amazing studio upstairs. In this studio, your family members can try their hands at painting, sculpture, coloring and more! Art supplies are provided and use of the studio is free with admission, so your only limit is your own imagination! During our most recent visit to Tacoma, my family ended up splitting up for part of our museum time. My 4-year-old daughter and I headed to the Children’s Museum of Tacoma, which is also located right in the heart of downtown. This museum is bright and clean and had lots for both of us to do. Plus, admission is by donation, so you can pay whatever you are able! We spent a really enjoyable afternoon building clay creations, exploring the forest exhibit, splashing in the water play area, and climbing on a giant boat. The men in our family took the Tacoma Link Light Rail streetcar (which is free to ride within Tacoma!) from downtown to the LeMay America’s Car Museum. This museum looks deceptively small from outside, but inside it is actually 4 stories in size (some below ground) and packed with all sorts of cars. The auto buffs in your family will have lots to admire. When we all met up again, my son and husband had many car stories and plenty of cool car pictures to share with us. The cars on display are switched out periodically so at LeMay, there’s always reason to return for another visit! Once you’ve explored downtown Tacoma, be sure to head out to Point Defiance Park. This park is home to several beautiful gardens, batting cages, go-karts, hiking trails, historic Fort Nisqually, and the Point Defiance Zoo and Aquarium (PDZA). 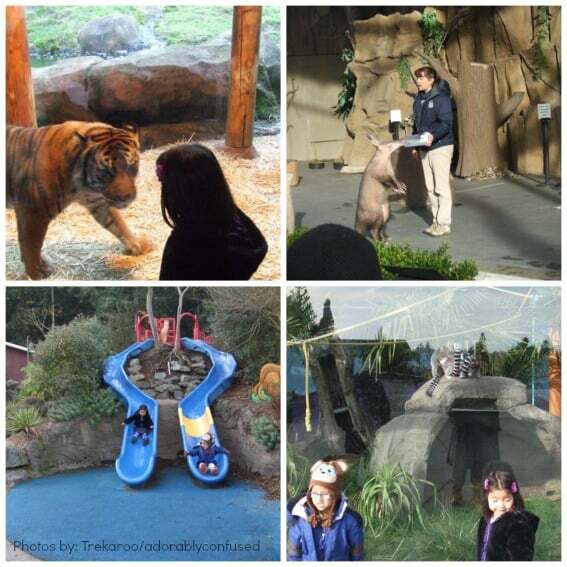 PDZA is a lovely little zoo with nice animal enclosures, a fantastic kids’ play area, and beautiful views of Mt. Rainier when the sun is shining! My family loved spending the afternoon at PDZA. We were able to see lots of animals, catch an animal show, and play in the kids’ areas without feeling rushed or exhausted at the end. There’s even a pretty carousel, so my daughter was able to get in a few rides (just $1 per ride) before we headed home. If you have the time to spend several days in Tacoma, Hotel Murano is a lovely place to relax and recharge when you’re not out exploring. Walking into the lobby and through the halls is like walking into another glass museum, with every floor featuring a different glass artist. This hotel is located within easy walking distance of restaurants, a grocery store, the museums, and the streetcar line. It has beautiful rooms with comfy beds as well as a fitness center and on-site dining at Bite. For family-friendly dining, Tacoma is home to the Old Spaghetti Factory restaurant, which consistently offers yummy food at affordable prices. Another great choice for families is Harmon Brewing Co. & Restaurant which has delicious food, great beer, and a wall of games to entertain your little ones while you wait for food to arrive! Tacoma is definitely a hidden gem and well worth visiting to explore all it has to offer. 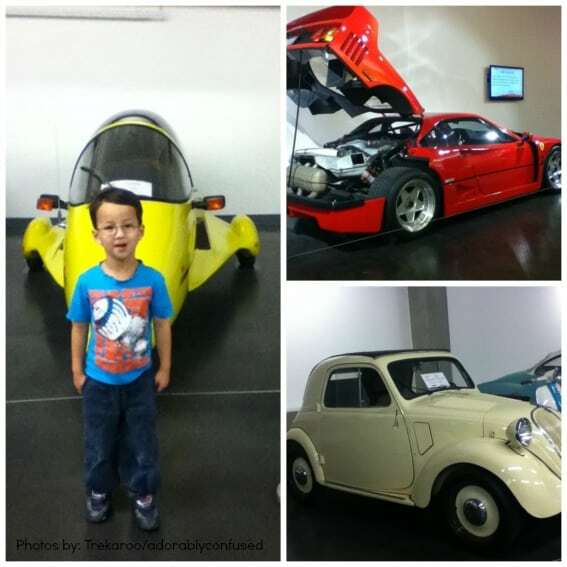 What are your family’s favorite things to do in Tacoma?